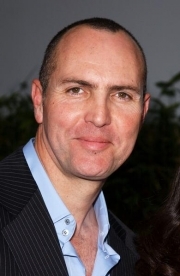 Arnold Vosloo is a South African American actor, best-known for playing Imhotep in The Mummy and its 2001 sequel The Mummy Returns, as well as the role of the superhero Darkman in the sequel Darkman II: The Return of Durant and its 1996 sequel, Darkman III: Die Darkman Die. and more recently, a South African Mercenary named Colonel Coetzee in the film Blood Diamond, a Middle Eastern terrorist named Habib Marwan in the television series 24, and Zartan in the film G.I. Joe: The Rise of Cobra and it's upcoming 2012 sequel, G.I. Joe: Retaliation. Vosloo was born in Pretoria, into an acting family, his parents having been stage-actors, and the family moved around quite a lot. They lived in Despatch, where his father ran a drive-in theater, and Alberton. He has one sister, Nadia. His acting talent was already discovered quite early in a school play. After High school and military service he inscribed at the Pretoria Technikon for drama courses. Vosloo began his acting career in the South African theatre where he won several Dalro Awards for his performances in such plays as Don Juan, Hamlet, and Môre is 'n Lang Dag and he quickly became a regular at Pretoria's State Theatre. He also starred in Torch Song Trilogy and won another award for the TV show, Meisie van Suid-Wes (Girl from South-West-Africa). In 1984, he moved on to film where he continued Dalro Award-winning performances in films such as Boetie gaan Border toe acting alongside fellow South African actor Frank Opperman, and Circles in a Forest (based on the book Kringe in 'n Bos by author Dalene Matthee) in 1990. Vosloo also starred in the "Boetie" sequel, Boetie op maneuvers in 1986. Vosloo also starred in Morenga , Saturday Night at the Palace , Skeleton Coast and The Rutanga Tapes . Upon arriving in the U.S., Vosloo returned to the theatre where he appeared in Born In The R.S.A. at Chicago's Northlight Theatre and in the NY's Circle In The Square Uptown's short-lived production of Salomé together with Al Pacino. His American film debut was in 1492: Conquest of Paradise . He later appeared in the two less successful sequels to the 1990 film Darkman &mdash; Darkman II: The Return of Durant and Darkman III: Die Darkman Die , filling the shoes of Liam Neeson as the titular character Darkman. He also starred in the John Woo film Hard Target, starring Jean-Claude Van Damme. Vosloo appeared in the title role of the 1999 film The Mummy , as well as its 2001 sequel, The Mummy Returns. In both films he played Imhotep, an ancient Egyptian high priest and the main antagonist. Vosloo also played the main villain François Molay in 2003 film Agent Cody Banks. In 2004, The Revenge of the Mummy: The Ride opened in both Universal Studios theme parks in Orlando and Hollywood. Vosloo and Fraser were there at both openings to promote the new rides, in which both of them star, as well as featuring a life size image of Vosloo as The Mummy. Alongside his film career, he guest-starred in several TV series including The Red Shoe Diaries, American Gothic , Nash Bridges , Charmed , Alias and NCIS He was one of the main characters in Veritas: The Quest . He also had a major role in the fourth season of 24 , as terrorist leader Habib Marwan. Vosloo appeared in three episodes of Chuck in 2009 as Fulcrum agent Vincent. In 2004, Vosloo returned to South Africa to make Forgiveness, about an ex-policeman who seeks out the family of the anti-Apartheid activist that he killed. His most recent film role was his role as the mercenary, Colonel Coetzee, in the 2006 film Blood Diamond which was partially filmed in South Africa. Recently, Vosloo has been involved in video games: His likeness, as well as his voice, was chosen for main hero of video game Boiling Point: Road to Hell, published in summer of 2005 by ATARI. Vosloo portrayed the Cobra mercenary and master of disguise, Zartan, in the summer 2009 release G.I. Joe: The Rise of Cobra. In 1988, Vosloo became a naturalized United States citizen after marrying his Act of Piracy co-star Nancy Mulford; they divorced three years later. On October 16, 1998, he married Southern California native Silvia Ahí, a Mexican-American marketing director. Vosloo and Ahí are spokespersons for the International Fund For Animal Welfare , this according to the group's website. In an interview with Charlie Rose, Vosloo noted he looked similar to American actor Billy Zane. According to Vosloo, when people came asking him if he was "the guy in Titanic", he replied "of course, of course!" as a joke. Whole or part of the information contained in this card come from the Wikipedia article "Arnold Vosloo", licensed under CC-BY-SA full list of contributors here.